Thank you for continuing our two-part series, Common Web-Building Spiders. Last week, you learned that there are several types of web-constructing spiders that live in and around the home. These arachnids specialize in the construction of silk webs so that they may easily capture prey. These spiders may build webs that will capture flying insects, or, they may construct webbing close to the ground to catch non-flying prey. In last week’s installment of this series, we expounded on the European House Spiders and the Long-Bodied Cellar Spiders. In this week’s installment, we will cover Cobweb Spiders, Orb Weaver Spiders, and Common Orb Weavers Spiders. Cobweb Spiders are included in a group of arachnids that are referred to as “Comb-Footed Spiders”. These are commonly found both on the inside and the outside of structures. They are medium spiders that are either brown or gray in color. 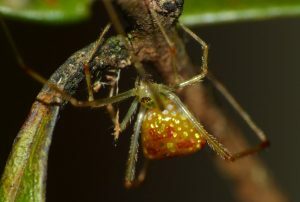 These are the spiders that construct the common tangled-looking webs that we most associate with web-building spiders. 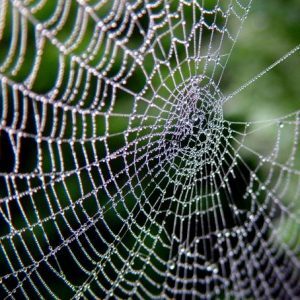 These webs are typically built in areas that are out-of-the-way or quiet. Examples include wood piles, piles of stone, and basements. These types of spiders are most commonly found in outdoor areas. They prefer landscapes, gardens, and even fields. While it is possible to discover this type of spider inside of a structure, it is not very common. These arachnids may be as small as 1/8 of an inch to 1 inch in length. Many are colored brightly while others are a bit darker in color. The abdomens of these arachnids are often large and appear to be somewhat swollen. Despite their vicious-looking appearance, these types of spiders are not considered to be dangerous to humans; however, it is a good idea that they are kept away from the home and the area immediately surrounding the home. These include the barn spider, the marbled orb weaver spider, and the argiope spider. These all vary in appearance. 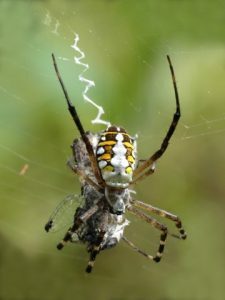 The argiope is common black and yellow and is found, mostly, in gardens. The barn spider includes a yellow and brown coloring and is commonly found in isolated regions. The marbled orb weaver spider is very bright and vibrant in color. They, too, are most often found outside, but, may be located inside of structures. When attempting to control a spider population, it is best to use a pest control management system that is offered by professionals. All Pest Exterminating, Inc. offers a comprehensive spider control system that not only eliminates the spider populations within your home, but, will also control the spider populations that are located outside of the home. First, the spider population will be identified by type. Then, other factors, such as their location and the danger that they pose to people and pets will be considered. Immediately thereafter, the best pest control management technique will be determined by the pest control company. If you would like to eliminate those pesky web-building spiders in and around your home, contact All Pest Exterminating, Inc. today!